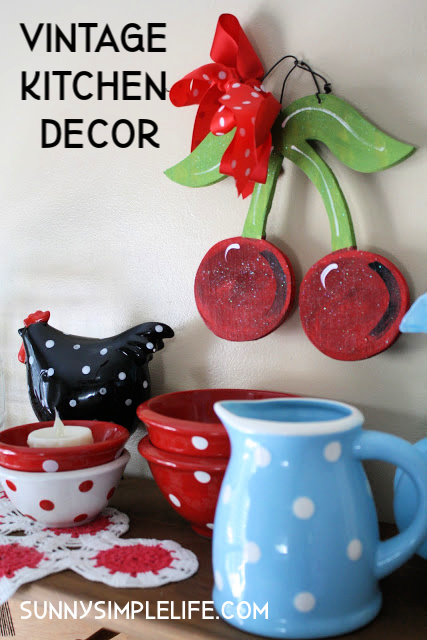 We have a vintage 1958 kitchen so finding fun vintage kitchen decor is always top of mind. This blue vase has been in this house for decades so we mixed it up with some polka dots and cherries for vintage decorating fun. While wiping the kitchen down and playing around with my shelf when I put everything back, I decided all the pokie dotted things needed to live together. My kids and their friends are making fun of my funny blue vase but I think she looks good up there by the little pitcher. What is it about dots? I love them. But I love a lot of stuff and that my friends can be a problem.